Jen Doyle and Joe Fowler | The Goose Is Out! If you were at the Mag to see Ewan McLennan (the first time he came), you will remember Jen Doyle and Joe Fowler who did a floorspot – worth the ticket money alone, we feel! The best version of Banks of the Sweet Primroses I have ever heard, bar none (and yes that does include Famous People). We predicted that these two were going to be big and hey, at the time they were local, so we were doubly pleased that they were able to do a half hour spot at DHFC supporting Jim Causley and also returned to the Mag as headliners in 2010, playing traditional songs and tunes from England, Ireland and Australia! They returned to the Goose for the Aquarius Festival ini the Summer of 2011, where they went down a storm. 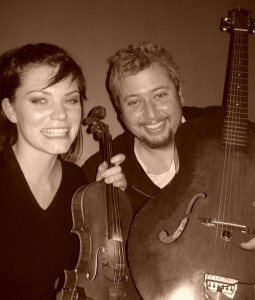 Jen plays traditional fiddle and met Nigel Kennedy once, who signed her violin with a permanent marker pen (ruining it). Joe Fowler sings simple songs and learned a lot about music from flute player Brian Warren who said ‘..its like you’re trying to break an egg with a sledge hammer’, after a performance. Nice!